All funds raised will go to Suzanne Prevost, the organizer for St. Jude Heroes Dark Side Challenge fundraiser. This is my fourth race as a part of the St. Jude Heroes program. St. Jude Heroes allows me the opportunity to combine my love of running with the ability to help out the children and families of St. Jude Children's Research Hospital. Did you know that families never, ever receive a bill for treatment? They also do not have to pay for accommodations, travel or meals while they are there. I feel like as a part of the St. Jude Heroes program I can help even in the smallest way. I can help St. Jude Children's Research Hospital provide hope and give all families the luxury of world-class medical treatment. 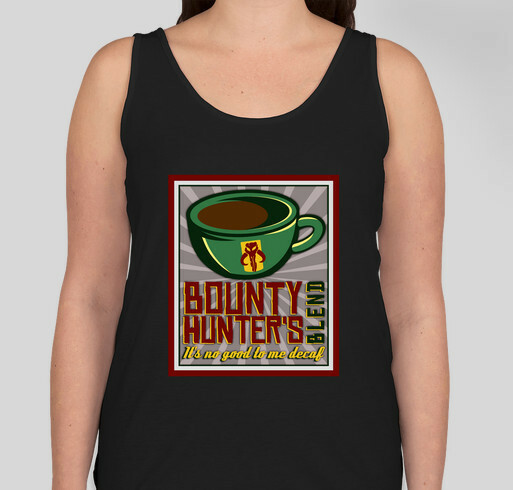 This year, I decided to combine my love of coffee and Star Wars (and a certain bounty hunter) and had a super talented graphic designer friend come up with the design for this t-shirt. This is a total win-win purchase. You get a totally one of a kind shirt to celebrate your love of coffee and the dark side. Plus you also help the children and families at St. Jude Children's Research Hospital. Share Why You Support "St Jude Heroes - running the Dark Side to help St. Jude Children's Research Hospital"